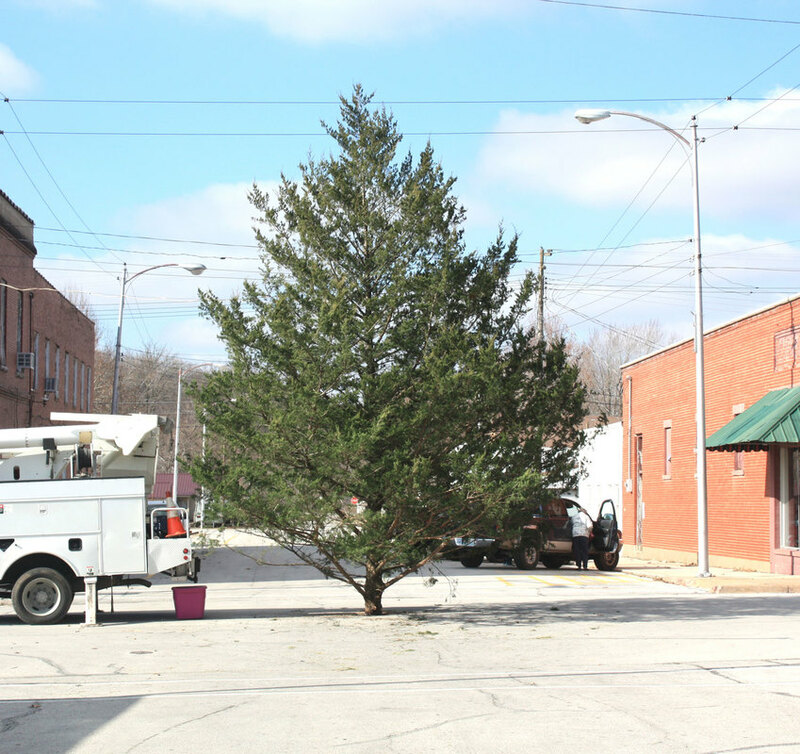 The City of Crane’s Christmas Tree was donated by the Hodsons again this year. The Hodsons have been donating the tree since 2014. The tree stands in the intersection of Main Street and Meadow Avenue. It will be well decorated before the Christmas Parade this Saturday, December 1. The Christmas season will swing into high gear starting this Saturday, December 1. Area Christmas parades and celebrations will be held all day on Saturday, starting with Kimberling City at 10 a.m.
Sunday, December 2, will see the 31st annual Hurley Christmas Lighting at Hurley Fire Station #1. Next weekend, Saturday, December 8, will see the return of the second Galena Christmas parade. Note: Both Kimberling City and Galena will have different parade routes this year. Be sure to keep reading to find out where to be to enjoy these parades. First up for this year’s Christmas parades is the Kimberling City Lions Club Christmas parade at 10 a.m. on Saturday, December 1. The theme this year is “Christmas Magic,” and there is a new route this year. Line up will begin at 9 behind the Kimberling Area Library. New route: The parade will go down Kimberling Blvd. as it has in past years. However, at the end of Kimberling, all regular sized floats will turn left onto Pink Sunset and continue around the back of the bank and into the Harter House parking lot. The parade will not cross Highway 13 this year. There will be trophies for the best construction/design, the best representation of the theme, the best costuming and for the most “wow” factor. In case of bad weather, the parade will be delayed until Saturday, December 8. All other details will remain the same. The first Reeds Spring Christmas Parade in several years will start at 2 p.m. on Saturday, December 1. The parade will begin at Dogwood Lane and continue down Main Street to City Hall. Line up will begin at 12 p.m.
Santa will be at City Hall for a cookies and hot chocolate meet and greet. Santa will also pose for pictures in front of the tree with visitors. The Crane Christmas Tree Lighting and Parade will be Saturday, December 1, starting at 5:30 p.m. with the parade beginning at 6 p.m.
Over 40 door prizes will be given away this year. Some of these prizes include gifts from Crane businesses, as well as tickets for Branson attractions. This year, only those 17 and older are eligible for door prizes. As in previous years, the parade will start in the Crane City Park, go up Missouri 13 and then down Main Street, ending at the Christmas Tree. To register for the parade, pick up a registration form at Crane City Hall. The 31st Annual Hurley Christmas Lighting will be Sunday, December 2, at 6 p.m. Everyone is invited to enjoy a “Holly Jolly Christmas” at Hurley Fire Protection District Station #1 in downtown Hurley, next to Tiger’s Den. There will be music, singing, an Ugly Sweater Contest, a 50/50 drawing, door prizes, including the chance to win a Barbecue Grill. Plus, Santa will be there for the kids. Anyone wishing to donate a dessert or who wishes to sing or play music should contact Chris Daugherty at (417) 369-3420 for more information. The best decorated house contest is on again this year. Cash prizes of $50, $30, and $20 for first, second, and third place. Judging will be done prior to the Christmas Lighting event. The second annual Galena Christmas Parade is on Saturday, December 8, at 5 p.m. Lineup will begin at 4 p.m. at James river Outfitters. Before the parade, the Galena High School senior class will be selling treats and warm. The best vintage car and best float will both receive a gift certificate. ​Participants should contact Keri Dickens at (417) 207-4811.